Sengan-en is an iconic Japanese garden in Kagoshima. 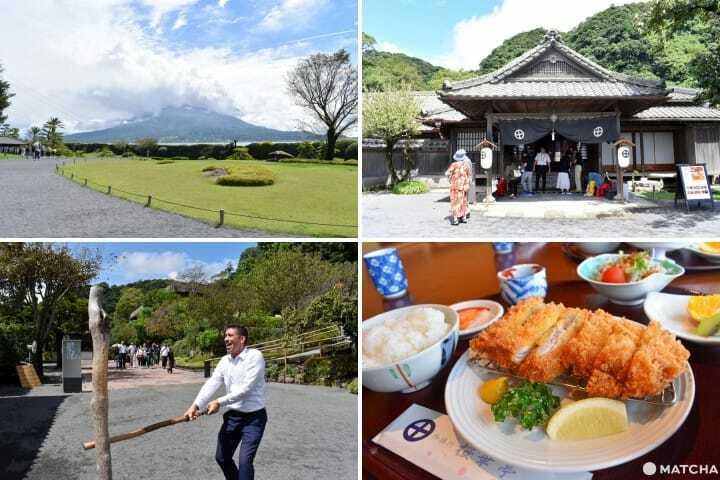 From views of Sakurajima to former samurai houses and a UNESCO World Heritage site, visitors can experience the history and culture here with all five senses. This article introduces 8 things to do. What is Kagoshima's Sengan-en Garden? A major sightseeing spot in Kagoshima is Sengan-en. It is a large garden that spans 50,000 square meters. It takes around 40 minutes to reach from central Kagoshima via direct bus. Sengan-en is known for its beauty, and visitors can also view spots, like a mansion that was the home of a feudal lord and a workshop where you can see traditional crafts. In 2018, the garden was a filming location for the Japanese Taiga drama (*1) "Segodon," gaining popularity. We feature eight ways to enjoy Sengan-en in this article! *1: Taiga drama: A serialized television drama broadcasted for a year on the NHK channel. The protagonist is often a historical figure and the filming locations generally become popular, attracting viewers. The Kagoshima area used to be called Satsuma up until the nineteenth century. Sengan-en was constructed in 1658 during the Edo period by Mitsuhisa Shimazu, who once ruled Satsuma. The Shimazu family had their main house in the Kagoshima City area and used Sengan-en as their villa. Currently, the garden and a portion of the building remainders is opened to the public. Let's go inside Sengan-en and see what there is to do! 1. Capture a Great Shot of Sakurajima Island! One of the most iconic spots in Sengan-en is the garden where you can see the Bay of Kagoshima and Sakurajima Island. Sakurajima Island is a volcanic island for which Kagoshima is famous for. Small eruptions occur sometimes even today. You can spot Sakurajima Island from various areas in Kagoshima City, but Sengan-en is thought to have a particularly spectacular view. Visitors can take in the wonderful view of a Japanese garden with Sakurajima Island. Sengan-en is an expansive Japanese garden, but it does not contain lakes or artificial hills that are commonly found in other gardens. Instead, the garden uses the natural landscape: the Bay of Kagoshima acts as the lake, and Sakurajima Island is the hill. Incorporating the surrounding landscape into the garden is a dynamic, creative way of thinking in garden architecture. This is referred to as "Shakkei-shiki teien" in Japanese. This can also be seen at the Adachi Museum of Art in Shimane Prefecture and at other Japanese gardens nationwide. Shown above is a gate called Suzumon. During the Edo period, they were used as entrance gates. Despite the compact appearance, the gate is made completely out of tin, so the roof weighs over one ton! Historically, only the leader and the heir of the Satsuma clan were able to pass through these prestigious gates. Anyone can go through the gates now. These were the same gates the actor, Ken Watanabe went through during the filming of the Taiga drama, "Segodon" that aired in 2018. Mr. Watanabe played the role of the 28th head, Nariakira Shimazu. There are many spots throughout the garden used for filming the drama. 3. Feel Like a Fuedal Lord at the Mansion! Once you pass the Suzumon gates, you will find a magnificent Japanese residence. It was formally used as the villa for the leaders of the Shimazu clan. At one point, this was a mansion used as a main house. It also served as a guesthouse to welcome important visitors from in and outside of Japan. The mansion is opened to the public. Let's go take a look inside. The step pictured above was used to distinguish between the space where the feudal lord and the subordinates used. The higher area was used by the feudal lord. This guest room was used as a reception room for important guests. It is said that this space even welcomed Nicholas II of Russia and King Edward VIII of the United Kingdom. The feudal lord would spend the majority of his day here. He would work and take his meal in this very room. This is also a scenic spot from which you can view the entire garden. Take a seat and enjoy the view of Sakurajima Island, just like the leaders of the Shimazu clan used to do. Since this was the residence of the clan head, the interior is decorated beautifully. If you look at the rooms and hallways carefully, you will find playful details throughout. The picture above shows decorative pieces used to hide nails called kugi kakushi. The designs vary according to the room and hallway. There are eleven types of kugi kakushi in the mansion. The colorful one on the upper left is the Sakurajima daikon radish that is a specialty of Kagoshima. The bat on the lower left was believed to be the ruler of happiness. A mountainous path extends through the back of the mansion and is a great spot to enjoy hiking. The moss covered path is known for its gorgeous appearance. There is an entrance way leading to a thirty-minute hiking course (one way) within the garden. Those who wish to climb the mountain should prepare walking shoes and comfortable clothes in advance. Note: The path is open from 8:30-16:00. Climbing is prohibited during poor weather. 5. Experience Traditional Martial Arts! For those who wish to move around more, you can try traditional Kagoshima martial arts by trying the Jigen-ryu. Jigen-ryu is a type of traditional martial art that has been passed down this region. In this practice, you must let out a loud scream while striking the wooden pole with a wooden sword. There are wooden swords and wood for striking you are welcome to use and practice on your own. Alex from England is a current student of the Jigen-ryu. Many people at the garden heard his yelling and turned to look when he struck the wood. The writer tried it too. The wooden sword was extremely heavy and muscle soreness followed the next day. There are two restaurants, cafes offering sweets, and areas to rest in the garden. During our visit, we had the Kurobuta pork loin cutlet set (1,380 yen with tax) at the restaurant, Shofuken. It uses Kurobuta pork from Kagoshima that was layered like a mille-feuille cake. The cutlet was very soft and full of flavor. There are also plenty of other delicious specialties of Kagoshima like the Kuroge wagyu and Kurobuta shabu shabu hot pot (1,980 yen with tax) where you can taste both the Kuroge wagyu beef and Kurobuta pork at the same time. There is also a sashimi platter (1,890 yen with tax) that uses fresh sashimi from the nearby ocean. Sengan-en is more than stunning garden. If you learn its history, you will be able to enjoy it even more. The picture above shows the remains of a reverberatory furnace that used to make canons. Around Sengan-en there used to be many factories. In the second half of the nineteenth century, Nariakira Shimazu, the 28th leader, took a step towards modernization and industrialization ahead of other areas of Japan. He was the first to create a group of European-style factories in Japan within Sengan-en. The technology developed at this very site became the source of industrial technology in Japan. Therefore the entire area of Sengan-en was designated as one of the sites of Japan’s Meiji Industrial Revolution in 2015 and became a World Heritage Site. Only the bases of the reverberatory furnace remain today but there was a twenty-meter high building standing that served as a core of the group of factories. Those who want to learn more about the history should visit the Shoko Shuseikan Museum. This is a great museum filled with information on the Shimazu clan and the culture of the Satsuma area and Southern Kyushu. A business endeavor started by the Shimazu clan continues in this factory even now. This is a glass craft called Satsuma Kiriko. Satsuma Kiriko layers colored glass on top of the clear glass and add designs by cutting the surface. The technique was developed in the nineteenth century. It was not practiced for a period of time, but it was revived in 1980 and is considered to be a traditional craft of Kagoshima. You can watch the making process for free at the factory next to Sengan-en. Reservations are not necessary and you can see the delicate craft handled by the skilled craftsmen up close. You can buy Satsuma Kiriko at the shop next to the factory or at souvenir shops in Sengan-en. One piece can cost from upwards of tens of thousands of yen, but this is a chance to find a special, high-quality piece of art for your home. It takes one hour or two hours to see the main areas of Sengan-en. It can take up to half-day if you want to leisurely explore. We recommend giving yourself enough time to look around. Sengan-en is a wonderful destination full of unique and charming finds, making it a must-visit! Nearest station "Sengan-en mae" stop on the Kagoshim City View tourism bus, Machi Meguri bus, City bus. Access Get on the Machi Meguri bus from Kagoshima Station and ride for approximately 35-minutes (170 yen) and get off at Sengan-en mae bus stop. Get off the Kagoshima City View bus from Kagoshima Station and ride for approximately 50-minutes (190 yen) and get off at Sengan-en mae bus stop. Price Admission to the garden, Shoko Shuseikan Museum, and mansion: adult (high school and above): 1300 yen. Elementary and middle school students: 650 yen. Kagoshima Travel Guide: 32 Sightseeing Spots, Local Food, and More!